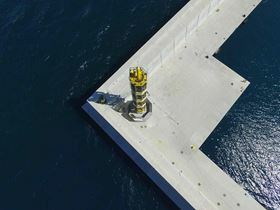 Huntsman Advanced Materials and Spanish renewable energy group Acciona Infraestructuras have worked together to deliver what they say is the world’s first ever all-composite lighthouse, now installed at the port of Valencia in Spain. Developed as a first prototype by Acciona Infraestructuras at the beginning of January 2013, this tower structure was completed in February 2015. Following the design and process selection, all composite components were manufactured within a month at Acciona’s composite workshop in Madrid. Combinations of hybrid, carbon fiber and glass fiber reinforced plastic composites were selected for the tower’s principal components, which required new material systems and processes to fulfil the design engineer’s vision for the 35 m tall tower structure. To construct the tower’s structural column, made of eight 35m long carbon fiber reinforced pultruded tubes with an outside diameter of 250mm and 20mm thickness, Acciona developed a special pultrusion process that produced very thick pultruded profiles combining carbon tows and heavy carbon fabrics. The glass fiber supplied by Owens Corning for the glass fiber reinforced tubes was specified for its ease of impregnation, faster pulling speed and better chemical resistance, the companies say. The architectural requirements stipulated that while the lightweight GFRP floors were subject to certain aesthetics and chemical resistance factors, they should also not exceed 20 cm thickness. Due to the constraints of cost, time, dimensional tolerance surface finish and ease of molding, Acciona decided to develop a resin infusion process to create the floors. As manufacturing needed to be fast, a resin system with low viscosity, long pot life and low exotherm, which could also meet the necessary chemical and mechanical properties, was developed by Huntsman Advanced Materials. The project also required the production of slip-free, light weight, chemically and mechanically resistant, glass fiber reinforced stairs that would not exceed 20 cm thickness. Composites made by resin transfer molding, using resin from Huntsman, were identified as providing the optimum solution. To join the pultruded tubes, and in order to achieve the low weight, low maintenance, smooth surface, chemical resistance and aesthetics required, the use of metal fasteners were ruled out and a new system was designed that could also meet the complex structural, geometric and budgetary requirements. As part of this new system, carbon and glass fiber stiffeners were designed and produced using a low exotherm resin developed by Huntsman. Acciona also selected Araldite adhesives to bond the lighthouse’s composite components together, chosen in preference to mechanical fastenings, which would detract from the look and add unnecessary weight to the final structure. Before the lighthouse was commissioned, final tests were conducted to ensure it met load and wind requirements. Whereas concrete builds typically take 28 days to be fully cured and a further 21 days to install, the all-composite lighthouse was completed in less than 20 days – six hours of which involved its installation, using a lightweight crane due to its advantageous size-to-weight ratio. The technologies developed and proven for the lighthouse project are currently under consideration in numerous other projects including towers for wind energy, columns for bridges and mobile antennas. This story is reprinted from material from Huntsman, with editorial changes made by Materials Today. The views expressed in this article do not necessarily represent those of Elsevier. Michael Kerner has received an award from ASTM International Committee A05 on Metallic-Coated Iron and Steel Products.